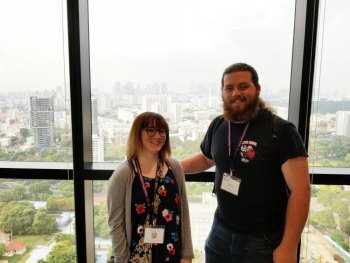 HUNTINGTON, W.Va. – Marshall University mathematics students Kira Owsley and Adam O’Neal, along with Associate Professor Dr. Michael Schroeder, traveled to Singapore in July to present research on discrete mathematics as part of the Conference on Combinatorics and its Applications. Owsley, a senior from Peck’s Mill, West Virginia, gave a presentation titled “On Primitive Cycle Decompositions of Complete Graphs.” It was based on work that she had started with support from the NASA Space Grant Consortium as well as the Summer Undergraduate Research Experience (SURE) at Marshall University. O’Neal, who is from Wayne County, West Virginia, gave a presentation titled “On Monochromatic Sets of Cardinality 2 of Nondecreasing Diameter,” based on work he started as an undergraduate and turned into his graduate thesis project. Their travel was covered by a grant from the National Science Foundation. Students, postdocs and early career mathematicians applied for the funding, and they were among only seven who received support. “The students were able to meet high-caliber mathematicians in their areas, and their talks were very well received,” Schroeder said. “They got a lot from it. We are doing things and going places in mathematics. Schroeder represented Marshall as well, delivering a presentation entitled “On Erasure Batch Codes,” based on research he did with fellow faculty members Dr. JiYoon Jung, Dr. Elizabeth Niese and Dr. Carl Mummert.